WorldGuy's Walk for Diabetes Awareness -: Circles, bridges, connections and directions. 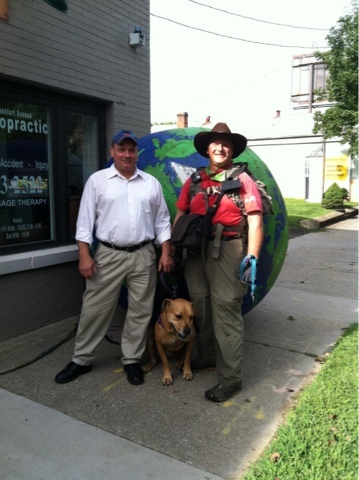 I began walking a week ago to my last chiropractor visit. I was staying at my good friends home on the outskirts of Louisville. It took two days to get into town. To the neighborhood where I first began rolling the world, seventeen years ago. with my then seven year old son. The third day I walked by the cemetery to my mother's memorial. Then I walked around the park in which we played. Where I, thru peer pressure, got the idea to walk for diabetes awareness. The next day I rested. I am rehabbing my pinched nerve, but wanted to get a feel of how well I could carry the weight of the backpack and shoulder bag. Yesterday I walked the rest of the way to the chiropractor's office. I wanted a picture of us together by the world. Without his expertise I could not be back on the road today. This morning, Saturday, I had my last visit before I left. My back feels better than it has in years. Aside from the nerve situation, that only time will heal, I feel I am getting better. We are officially back on the road. 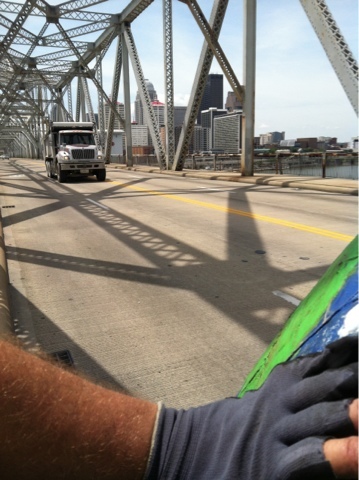 Friday after I stopped at Dr. Fred's we rolled through downtown and onto the bridge over The Ohio River into Indiana. A friend of mine has a home just over the bridge where we stowed the world away. I have walked from Fern Creek to the Highlands, around Cherokee Park, up the steepest cobblestone street left in the city to Doc's, then thru old Butchertown and up Louisville's Main St. to the Clark Memorial Bridge. I made it half of the way across in the "shared bike lane" that was clearly marked when a Louisville policeman had me get off the roadway. I was not riding a bicycle. I then balanced the world atop the outside rail of the bridge and rolled it to the Indiana side. No harm, no foul. He was doing his job and the world is safely away. Two weeks ago the construction for another bridge over the river began and many routes have been closed; adding extra burden on the bridge. I was surprised I got as far as I did. 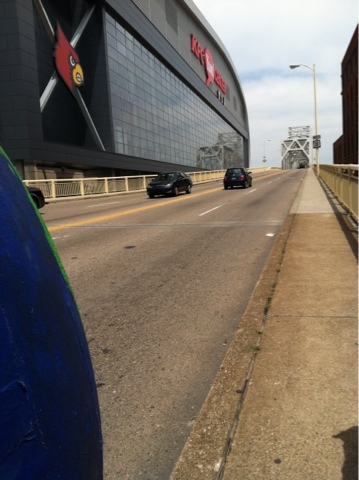 Four years ago we rolled over the same bridge in the morning of the Kentucky Derby.There was no Northbound traffic and only a few cars going south. I was there for lunch hour, Friday. I wrote a few partial post during this week of reflection. I will now post these all at once, incomplete as they may be.. Such as the detail ---where am I going? I just stopped and talked to you in Indiana on Highway 62! Hi!!! Hello! We are at the edge of Charlestown for the night. We seen you on our way to church this morning on 62. My son asked what you were doing & I told him that special people do things for special causes. Little did I know you were walking for diabetes! See my son was diagnosed with type 1 diabetes 3 years ago. I told my son what you were walking for & you made him feel special! So Thank You! !